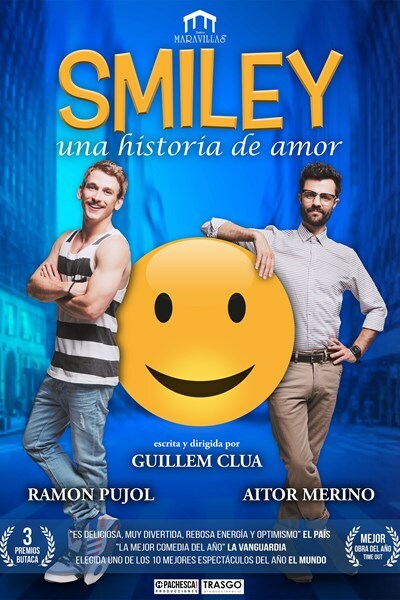 Smiley is a love story, an intelligent and simple text that tributes traditional romantic comedies, setting them in the XXIst Century to overcome clichés and free their characters from molds and tags. Beyond the sexual orientation of their characters, Smiley makes us see how we all are vulnerable to love; ugly, handsome, clever, dumb, gay or heterosexual, left or right wing… butterflies in the stomach are always the same. There’s a Japanese legend that says a red thread unites people destined to one another since birth. Alex and Bruno, couldn’t be more different. This strange couple only has in common they’re both men and they’re in love. Alex is suffering from a love disappointment; he’s put his hopes up with someone that just disappeared. Bruno is not looking for someone like Alex, but ends up meeting him. What starts like a coincidence will change their lives.